Have a question about DAA D-Aspartic Acid? What is it, what does it do, how and when to use or something else? Ask us. 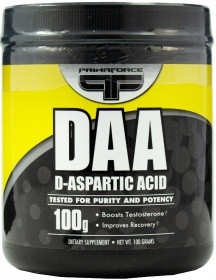 “D-Aspartic Acid DAA 100g” is currently out of stock. Enter your details below and we will let you know when it's back in stock. “D-Aspartic Acid 300g” is currently out of stock. Enter your details below and we will let you know when it's back in stock. ALLERGEN INFORMATION: This product is manufactured and packaged in a facility which may also process milk, soy, wheat, egg, peanuts, tree nuts, fish and crustacean shellfish. As a food supplement consume one serving (3g) per day, with breakfast or the first meal of the day. WARNINGS DAA D-Aspartic Acid : Do not exceed the recommended daily dosage. Not intended for use by persons under age 18. If you are pregnant or nursing or are taking any prescription medication, consult your health care professional before using this or any other dietary supplement product. Immediately discontinue use and consult your doctor if any adverse reaction occurs. Food supplements should not be used as a substitute for a varied and balanced diet and healthy lifestyle. Keep out of reach of children. Store in a cool dry place away from excessive heat, moisture, or sunlight.